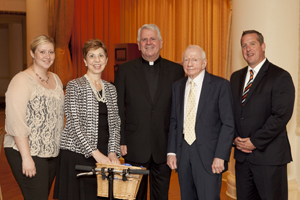 At the Healey Educational Foundation’s Sept. 5 banquet were, from left: Erin McShea; Sue Pine; Father Paul Kennedy, pastor of St. Katherine of Siena Parish in Philadelphia; Robert Healey; and Jason Budd, deputy secretary for Catholic education of the Archdiocese of Philadelphia. St. Katherine of Siena School in Northeast Philadelphia received a $20,000 grant from the Healey Education Foundation Sept. 5. The foundation’s SAGE competitive grant (School Advancement Grants for Excellence) is intended to strengthen St. Katherine School’s advancement efforts. The grant recognizes outstanding work in implementing the foundation’s Catholic School Development Program (CSDP) methodology to achieve sustainable growth in five areas including governance, enrollment management, development, communications and operations. St. Katherine’s was one of 17 schools that submitted proposals on how the award would be applied at their school. St. Katherine School is one of six Catholic elementary schools in the Archdiocese of Philadelphia participating in the PACE pilot project (Partners Advancing Catholic Education), made possible through the Healey Education Foundation’s partnership with the Connelly Foundation. The school’s winning proposal highlighted its early achievements: enrollment growth of 11 percent in just one year; the successful opening of two pre-K classes in 2012-13; formation of a 21-member board of limited jurisdiction; contact initiated with more than 5,000 alumni and introduction of an annual fund. The school also provided an action plan and budget for upgrading marketing materials, implementing data management systems and creating an advancement team to achieve its broader public relations goals and represent the mission of the school through “a level of professionalism once seen only in higher education institutions,” according to the award citation. The award was presented at a Healey Education Foundation dinner Sept. 5 in Philadelphia, which was attended by 138 guests including diocesan representatives, pastors, school principals and advancement directors. At the event, the foundation also announced winners of the SAGE grants for outstanding work in enrollment management and fundraising, and recipients of the Certified Methodology Expert (CME) credential. The foundation provides consulting services through a staff of experts focused on helping schools help themselves. Best practices include an empowered laity through a policy-making board of limited jurisdiction and the hiring of a full-time advancement director. The CSDP approach also creates a culture of philanthropy in which mission-based fundraising succeeds through well-run annual appeals and major gift programs. Since CSDP was established in 2004, nearly 60 elementary and high schools in three dioceses have adopted and practiced its approach to deliver better enrollment, stronger fundraising and more effective governance.